Kolorco is committed to digital workflows. All jobs for print should be supplied electronically. The preferred file format for this is the Portable Document Format (PDF). To produce a PDF file is simply a matter of distilling a postscript file, usually with Adobe’s Acrobat Distiller. Please Note that this has to be a press quality PDF. Acrobat 4.0 and above is supplied with pre-set Press Optimised settings. Kolorco has current MAC and PC versions of industry standard applications: QuarkXpress, Powerpoint, Word, Photoshop, Illustrator, Acrobat and InDesign. 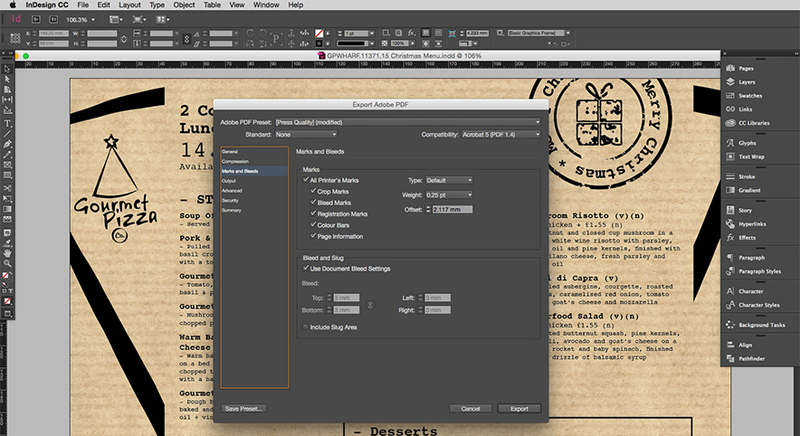 Allow for bleed in the document and in the print options – minimum 3mm. Variations in type design or font substitution can compromise the printed results. For example, the most common typeface ‘Times’ is available in a variety of versions: Times New Roman, Times, and Times Roman, to name a few of the most frequently used. Each differs slightly in design and kerning or tracking values are different. Producing PDFs will help eliminate these problems by showing a proper representation of the finished document and showing that the correct fonts are embedded.